This dramatic footage shot in Glendale, Los Angeles County on Tuesday shows the moment a shop lifter rammed his way through several police cars while making his escape. Glendale Police Department officers were responding to reports of shoplifting at a Vons supermarket branch, and the suspect showed no signs of wanting to stop. One officer was able to spin the car around, with another police vehicle soon arriving to block the Mustang. 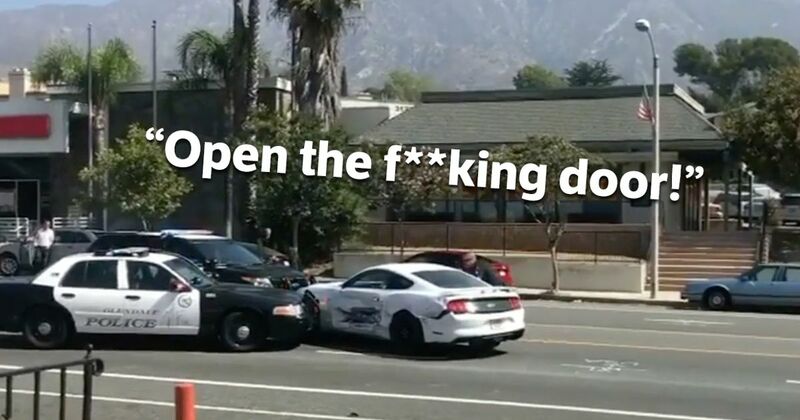 Rather than reverse away, the Mustang driver nearly mashed his foot on the pedal while cops shouted at him to stop and open the door. Eventually, he freed the car, at which point a third police car arrived. Which he rammed too. He was able to escape the scene, before parking up, dumping the battered Ford and escaping on foot. Despite police setting up a perimeter and deploying a helicopter plus K9 dog units, the man could not be found. By 2.15pm the search was suspended, and the suspect remains at large.